1. Buy box of Valentine’s Day cards. 2. Thank the Lord that child picked a box that has 34 Valentines rather than 1 box with 12 Valentines. No need to buy 3 boxes. 4. Help daughter begin making Valentines. Note that it’s 3 weeks before Valentine’s Day. Plenty of time! 5. Watch daughter cut out very specifically and from the middle of each page the first 3 kids’ names and photos that she wants to make Valentines for. 6. Watch daughter use glue stick to put the names and photos on 3 Valentines. 7. Help by folding 3 Valentines in half and using heart stickers to secure the Valentines. 8. Watch daughter write her name on each Valentine. 9. Realize an hour has gone by and there’s dinner to cook, laundry to fold, and extracurricular activities to attend. 10. Put Valentine’s cards away. 11. Ask the next day if daughter wants to do Valentine’s. Listen as she says no thanks. 15. Make daughter do 3 more Valentines. Say encouraging words to show her how FUN this is. Allow her to start signing her nickname instead of her full name. 16. Repeat 11. Every day for the next 2 weeks. 17. Realize there are only hours left before Valentines are due. Beg, plead, and encourage daughter to work on them. 18. Start helping. A little glue here. A little cutting there. 19. Feed daughter M&Ms and promise lots of cuddle time if She. Just. Does.Valentines. 19. Help a lot more. Just keep smiling. 20. 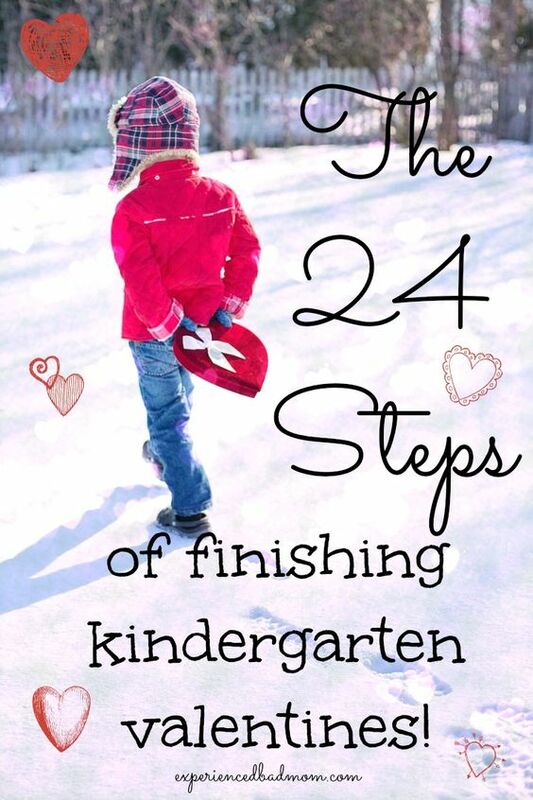 Send 26 lovely Valentine’s to school with daughter. How did it go in your house making Valentines this year? Are you spying on me??? We did Valentine bracelets on Saturday. My nine year old finished hers pretty independently. My 2 year old handed me beads like a champ. My five year old son? Still working on them. I *made* him do four last night. If we can do another 4 tonight and the next night we’ll be set. He got stuck when he got to a kid he didn’t like. He told me that Isaiah was mean and he didn’t want to give him a Valentine. GRRRR!!! Ha ha! Must be the age? My kindergartner definitely picked out the kids whose Valentine’s she wanted to make first. Then I ended up with 3 ragged, hanging sheets of paper with all the second class citizens on them! Ours were due yesterday so we’re done. Phew. Wait–you don’t do Valentine’s in Australia? I’m soooo moving back! Except maybe I’d miss the candy at Halloween. Interesting. We gave our whole classroom Valentines even back the 70s! I remember those days – too funny! So politically correct to give EVERY kid a valentine. And so silly. My kids are grown now, so I just make brownies for my husband. Much easier. Happy V-day! Yessss. By the time we had, what, 4 Valentine’s left to do, her eyes were glazed over and it was all I could do not to try and sign her name for her! I totally appreciated your toilet paper craft on your blog! Too cute. Thanks for stopping by from the Blogelina comments. Hahahhahah, I had to do 30 Spider Man one’s for one son, and 27 Toy Story ones for the other son. They completed 3 between the two of them, and then started fighting over the markers. I was annoyed out of my skull. There has to be a better way! When you find the better way (and if it involves wine), let me know. Oh man … I have a kindergardener too and he showed absolutely no interest. I just bought rice krispie treats and printed off labels with his name on it and smacked those stickers on. Of course he’ll be super excited today to hand them out and receive them. This sadly is a trend with homework too – I make him do the homework of course, but he whines and whimpers the whole time. Ugh! Just sent ours in with our kindergarten daughter today and thank goodness. It was a labor of love to be sure. Wine was definitely involved. We weren’t allowed to send candy in to our school (boo) which took some of the motivation and excitement out of the process. LOL oh my. I remember dreading Valentine’s Day when I worked in childcare. Sorting all those Valentines and dealing with tears when Valentines get mixed up or lost… no fun at all! I like the drink wine part of your instructions… awesome. bahahahahahahaha. Same goes for grade 1 and 4. Thankfully, this year my 13yo is long since done with Valentines and my 10yo happily finished hers (with a little help) in under an hour. Phew!